Figure 8 of Walter, Mol Vis 2008; 14:906-921. Figure 8. Effects of Psf2MO and CONMO injections on cell proliferation in the neural retina and lens. 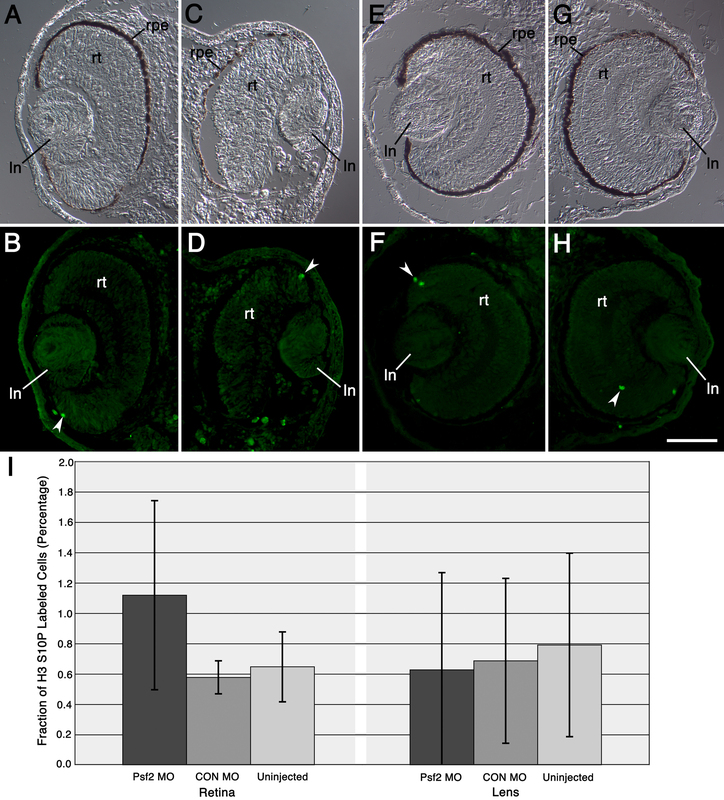 A-H: Transverse sections of eyes in Psf2MO-injected and CONMO-injected embryos show corresponding pairs of differential interference contrast and fluorescence micrographs. Fluorescence micrographs in B, D, F, and H show distribution of proliferating cells labeled with anti-phospho-histone H3 S10P antibody (green). White arrowheads point to examples of these labeled cells within the retina. A and B: The normal, control eye derived from the uninjected side of one example is displayed. C and D: Opposite, defective eye derived from the Psf2MO-injected side of the same embryo shown in A-B is displayed in these panels. E and F: The normal, control eye derived from the uninjected side of another embryo is shown. G and H: Opposite, normal-appearing eye derived from the CONMO-injected side of the same embryo shown in E-F is displayed in these panels. I: Graphical depiction of the levels of cell proliferation in the neural retina and the lens is shown. Bars represent the mean fraction of histone H3 S10P labeled cells (depicted as a percentage along the y-axis) while the different tissues and conditions examined are depicted along the x-axis, as indicated. Error bars representing the standard deviation are also shown. See Methods for further details explaining the preparation of this data. Labels are the same as those used in Figure 4. Scale bar in H equals 100 µm.